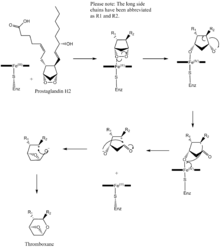 Thromboxane A synthase 1 (platelet, cytochrome P450, family 5, subfamily A), also known as TBXAS1, is a cytochrome P450 enzyme that, in humans, is encoded by the TBXAS1 gene. This gene encodes a member of the cytochrome P450 superfamily of enzymes. The cytochrome P450 proteins are monooxygenases that catalyze many reactions involved in drug metabolism and synthesis of cholesterol, steroids, and other lipids. However, this protein is considered a member of the cytochrome P450 superfamily on the basis of sequence similarity rather than functional similarity. This endoplasmic reticulum membrane protein catalyzes the conversion of prostaglandin H2 to thromboxane A2, a potent vasoconstrictor and inducer of platelet aggregation and 12-Hydroxyheptadecatrienoic acid (i.e. 12-(S)-hydroxy-5Z,8E,10E-heptadecatrienoic acid or 12-HHT) and agonist of Leukotriene B4 receptors (i.e. BLT2 receptors) and mediator of certain BLT2 receptor]] actions. The enzyme plays a role in several pathophysiological processes including hemostasis, cardiovascular disease, and stroke. The gene expresses two transcript variants. Thromboxane synthase inhibitors are used as antiplatelet drugs. Ifetroban is a potent and selective thromboxane receptor antagonist. Dipyridamole antagonizes this receptor too, but has various other mechanisms of antiplatelet activity as well. Picotamide has activity both as a thromboxane synthase inhibitor and as a thromboxane receptor antagonist. The human thromboxane A (TXA) synthase is a 60 kDa protein with 533 amino acids and a heme prosthetic group. This enzyme, anchored to the endoplasmic reticulum, is found in platelets, monocytes, and several other cell types. The NH2 terminus contains two hydrophobic segments whose secondary structure is believed to be helical. Evidence suggests that the peptides serve as a membrane anchor for the enzyme. Moreover, the study of cDNA clones made possible by polymerase chain reaction techniques has further elucidated the TXA synthase’s primary structure. Similar to other members in the cytochrome P450 family, TXA synthase has a heme group coordinated to the thiolate group of a cysteine residue, specifically cysteine 480. Mutagenesis studies that made substitutions at that position resulted in loss of catalytic activity and minimal heme binding. Other residues that had similar results were W133, R478, N110, and R413. Located near the heme propionate groups or the distal face of the heme, these residues are also important for proper integration of heme into the apoprotein. Unfortunately, researchers have found it difficult to obtain a crystal structure of TXA synthase due to the requirement of detergent treatment extraction from the membrane but they have utilized homology modeling to create a 3D structure. One model showed two domains, an alpha-helix-rich domain and a beta-sheet-rich domain. The heme was found to be sandwiched between helices I and L.
This isomerization mechanism shows prostaglandin H2 being converted to thromboxane. A heme group coordinated to a cysteine residue from the enzyme, thromboxane synthase, is involved in the mechanism. Thromboxane A (TXA) is derived from the prostaglandin H2 (PGH2) molecule. PGH2 contains a relatively weak epidioxy bond, and a possible mechanism is known to involve homolytic cleavage of the epidioxide and a rearrangement to TXA. A heme group in the active site of TXA synthase plays an important role in the mechanism. Stopped-flow kinetic studies with a substrate analog and recombinant TXA synthase revealed that substrate binding occurs in two steps. First, there is a fast initial binding to the protein and then a subsequent ligation to the heme iron. In the first step of the mechanism, the heme iron coordinates to the C-9 endoperoxide oxygen. It participates in homolytic cleavage of the O-O bond in the endoperoxide, which represents the rate-limiting step, and undergoes a change in redox state from Fe(III) to Fe(IV). A free oxygen radical forms at C-11, and this intermediate undergoes ring cleavage. With the free radical now at C-12, the iron heme then oxidizes this radical to a carbocation. The molecule is now ready for intramolecular ring formation. The negatively charged oxygen attacks the carbonyl, and the electrons from one of the double bonds are drawn to the carbocation, thus closing the ring. Maintaining a balance between prostacyclins and thromboxanes is important in the body, particularly because these two eicosanoids exert opposing effects. In catalyzing the synthesis of thromboxanes, TXA synthase is involved in a flux pathway that can modulate the amount of thromboxane produced. This control becomes an important factor in several processes, such as blood pressure regulation, clotting, and inflammatory responses. Dysregulation of TXA synthase and an imbalance in the prostacyclin-thromboxane ratio are thought to underlie many pathological conditions, such as pulmonary hypertension. Because thromboxanes play a role in vasoconstriction and platelet aggregation, their dominance can disrupt vascular homeostasis and cause thrombotic vascular events. Furthermore, the importance of thromboxanes and their synthases in vascular homeostasis is illustrated by findings that patients whose platelets were unresponsive to TXA displayed hemostatic defects and that a deficiency of platelet TXA production led to bleeding disorders. Furthermore, it has been found that the expression of TXA synthase may be of critical importance to the development and progression of cancer. An overall increase in TXA synthase expression has been observed in a variety of cancers, such as papillary thyroid carcinoma, prostate cancer, and renal cancer. Cancer cells are known for their limitless cellular replicative potential, and it has been hypothesized that changes in eicosanoid profile affect cancer growth. Research has led to the proposal that TXA synthase contributes to a range of tumor survival pathways, including growth, apoptosis inhibition, angiogenesis, and metastasis. ↑ "Diseases that are genetically associated with TBXAS1 view/edit references on wikidata". 1 2 "Entrez Gene: TBXAS1 thromboxane A synthase 1 (platelet, cytochrome P450, family 5, subfamily A)". ↑ Yokoyama C, Miyata A, Ihara H, Ullrich V, Tanabe T (August 1991). "Molecular cloning of human platelet thromboxane A synthase". Biochem. Biophys. Res. Commun. 178 (3): 1479–1484. doi:10.1016/0006-291X(91)91060-P. PMID 1714723. ↑ Baek SJ, Lee KD, Shen RF (September 1996). "Genomic structure and polymorphism of the human thromboxane synthase-encoding gene". Gene. 173 (2): 251–256. doi:10.1016/0378-1119(95)00881-0. PMID 8964509. ↑ Dockens RC, Santone KS, Mitroka JG, Morrison RA, Jemal M, Greene DS, Barbhaiya RH (August 2000). "Disposition of radiolabeled ifetroban in rats, dogs, monkeys, and humans". Drug Metab. Dispos. 28 (8): 973–80. PMID 10901709. ↑ Ratti S, Quarato P, Casagrande C, Fumagalli R, Corsini A (August 1998). "Picotamide, an antithromboxane agent, inhibits the migration and proliferation of arterial myocytes". Eur. J. Pharmacol. 355 (1): 77–83. doi:10.1016/S0014-2999(98)00467-1. PMID 9754941. ↑ Ruan KH, Kulmacz RJ, Wu KK (1994). "Characterization of the Structure and Membrane Interaction of NH2-terminal Domain of Thromboxane A2 Synthase". The Journal of Biological Chemistry. 269 (33): 20938–20942. PMID 8063711. ↑ Ohashi K, Ruan KH, Kulmacz R, Wu KK, Wang LH (1992). "Primary Structure of the Human Thromboxane Synthase Determined from the cDNA Sequence". Journal of Biological Chemistry. 267 (2): 789–793. PMID 1730669. 1 2 Wang LH, Kulmacz RJ (2002). "Thromboxane synthase: structure and function of protein and gene". Prostaglandins and Other Lipid Mediators. 68-69: 409–422. doi:10.1016/s0090-6980(02)00045-x. PMID 12432933. ↑ Hsu PY, Tsai AL, Wang LH (2000). "Identification of Thromboxane Synthase Amino Acid Residues Involved in Heme-Propionate Binding". Archives of Biochemistry and Biophysics. 383 (1): 119–127. doi:10.1006/abbi.2000.2041. PMID 11097184. ↑ Hecker M, Ullrich V (1989). "On the Mechanism of Prostacyclin and Thromboxane A2 Biosynthesis". The Journal of Biological Chemistry. 5 (264): 141–150. PMID 2491846. ↑ Tanabe T, Ullrich V (1995). 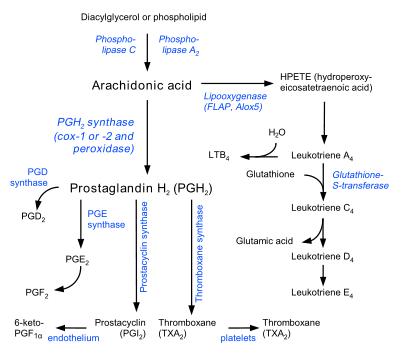 "Prostacyclin and Thromboxane Synthases". Journal of Lipid Mediators and Cell Signaling. 12: 243–255. doi:10.1016/0929-7855(95)00031-k. PMID 8777569. ↑ Brugger R, Ullrich V (2003). "Prostacyclin and Thromboxane Synthase: New Aspects of Hemethiolate Catalysis". Angewandte Chemie. 33 (19): 1911–1919. doi:10.1002/anie.199419111. ↑ Pratico D, Dogne JM (2009). "Vascular biology of eicosanoids and atherogenesis". Expert Reviews. 7 (9): 1079–1089. doi:10.1586/erc.09.91. PMID 19764861. ↑ Shen RF, Tai HH (1998). "Thromboxanes: Synthase and Receptors". Journal of Biomedical Science. 5 (3): 153–172. doi:10.1007/bf02253465. PMID 9678486. ↑ Cathcart MC; Reynolds JV; O’Byrne KJ; Pidgeon GP (2010). "The role of prostacyclin synthase and thromboxane synthase signaling in the development and progression of cancer". Biochimica et Biophysica Acta. 1805 (2): 153–166. doi:10.1016/j.bbcan.2010.01.006. PMID 20122998. Shen RF, Tai HH (1998). "Thromboxanes: synthase and receptors". J. Biomed. Sci. 5 (3): 153–172. doi:10.1007/BF02253465. PMID 9678486. Smith G, Stubbins MJ, Harries LW, Wolf CR (1999). "Molecular genetics of the human cytochrome P450 monooxygenase superfamily". Xenobiotica. 28 (12): 1129–1165. doi:10.1080/004982598238868. PMID 9890157. Wang LH, Kulmacz RJ (2003). "Thromboxane synthase: structure and function of protein and gene". Prostaglandins Other Lipid Mediat. 68-69: 409–422. doi:10.1016/S0090-6980(02)00045-X. PMID 12432933. Itoh S, Yanagimoto T, Tagawa S, et al. (1992). "Genomic organization of human fetal specific P-450IIIA7 (cytochrome P-450HFLa)-related gene(s) and interaction of transcriptional regulatory factor with its DNA element in the 5' flanking region". Biochim. Biophys. Acta. 1130 (2): 133–8. doi:10.1016/0167-4781(92)90520-a. PMID 1562592. Yokoyama C, Miyata A, Ihara H, et al. (1991). "Molecular cloning of human platelet thromboxane A synthase". Biochem. Biophys. Res. Commun. 178 (3): 1479–1484. doi:10.1016/0006-291X(91)91060-P. PMID 1714723. Ohashi K, Ruan KH, Kulmacz RJ, et al. (1992). "Primary structure of human thromboxane synthase determined from the cDNA sequence". J. Biol. Chem. 267 (2): 789–93. PMID 1730669. Jones DA, Fitzpatrick FA, Malcolm KC (1991). "Thromboxane A2 synthesis in human erythroleukemia cells". Biochem. Biophys. Res. Commun. 180 (1): 8–14. doi:10.1016/S0006-291X(05)81247-1. PMID 1930241. Wang LH, Ohashi K, Wu KK (1991). "Isolation of partial complementary DNA encoding human thromboxane synthase". Biochem. Biophys. Res. Commun. 177 (1): 286–291. doi:10.1016/0006-291X(91)91980-Q. PMID 2043115. Nüsing R, Schneider-Voss S, Ullrich V (1990). "Immunoaffinity purification of human thromboxane synthase". Arch. Biochem. Biophys. 280 (2): 325–330. doi:10.1016/0003-9861(90)90337-X. PMID 2195994. Mestel F, Oetliker O, Beck E, et al. (1980). "Severe bleeding associated with defective thromboxane synthetase". Lancet. 1 (8160): 157. doi:10.1016/S0140-6736(80)90642-X. PMID 6101498. Miyata A, Yokoyama C, Ihara H, et al. (1994). "Characterization of the human gene (TBXAS1) encoding thromboxane synthase". Eur. J. Biochem. 224 (2): 273–279. doi:10.1111/j.1432-1033.1994.00273.x. PMID 7925341. Wang LH, Tazawa R, Lang AQ, Wu KK (1995). "Alternate splicing of human thromboxane synthase mRNA". Arch. Biochem. Biophys. 315 (2): 273–278. doi:10.1006/abbi.1994.1500. PMID 7986068. Lee KD, Baek SJ, Shen RF (1994). "Cloning and characterization of the human thromboxane synthase gene promoter". Biochem. Biophys. Res. Commun. 201 (1): 379–387. doi:10.1006/bbrc.1994.1712. PMID 8198598. Chase MB, Baek SJ, Purtell DC, et al. (1993). "Mapping of the human thromboxane synthase gene (TBXAS1) to chromosome 7q34-q35 by two-color fluorescence in situ hybridization". Genomics. 16 (3): 771–773. doi:10.1006/geno.1993.1264. PMID 8325653. Tazawa R, Green ED, Ohashi K, et al. (1996). "Characterization of the complete genomic structure of human thromboxane synthase gene and functional analysis of its promoter". Arch. Biochem. Biophys. 334 (2): 349–356. doi:10.1006/abbi.1996.0464. PMID 8900410. Baek SJ, Lee KD, Shen RF (1996). "Genomic structure and polymorphism of the human thromboxane synthase-encoding gene". Gene. 173 (2): 251–256. doi:10.1016/0378-1119(95)00881-0. PMID 8964509.